I have continued to research and experiment with stereo / binaural recording and studio techniques for use with Sound Design for 360 video. In 2016 a short 360 video clip was featured on, ‘BBC Click 360: The world’s first entirely 360 TV episode‘. The clip is taken from ‘The Resistance Of Honey’ a BBC 360 video documentary featuring Bioni Samp’s art, music and sound design. Directed by Peter Boyd Maclean. It has featured at film festivals around the world, including: I-Docs Documentary Festival Bristol 2016, Sheffield Documentary Festival 2016 in the BBC 360 cinema area, International Documentary Film Festival Amsterdam 2016 (https://www.idfa.nl/industry/tags/pro…) and The Festival of Future Storytelling NYC 2016 https://futureofstorytelling.org/proj…. Step inside the world of Bioni Samp, an urban beekeeper who makes honey – and music – from his bees. This immersive 360 profile takes you deep inside the beehive. Peter Boyd Maclean’s film uses cinematic narrative conventions with immersive sound and vision in order to intensify the experience of becoming fully immersed in the story. It breaks new ground in constructing 360 sequences and close ups without using fades and particularly using sound to create a more immersive environment. Welcome to the fascinating world of urban beekeeper Bioni Samp. His bees don’t just make honey – they also make music. Always clad in his beekeeper’s suit and mask, Samp makes audio recordings in the hive, then analyses and processes these. But he doesn’t stop there – even the honey itself makes sound, and Samp has discovered that every honey has a different one. He processes them into experimental electronic music using home-made instruments. Samp regularly uses these sounds in performances, and deejays at ecological festivals. 360-degree recordings from inside the beehive and the shed/studio of this urban nomad are interspersed with close-ups of the world of the bees. But of course the sound is always the principal factor in this mind-expanding, immersive experience. The soundtrack features all original binaural beehive recordings and live ‘Hive Synthesiser‘ music by Bioni Samp. It also includes clips of the tracks: ‘Inner Chambers’, Tom Puddings’, Night Coal’, ‘Pyramids Along The Aire’. (9 Oscillator prototype) BeeVerb BFX, Baby Bee Synth, theBee (formerly the DBox), Binaural Beeframe EMF Detector, Yamaha Fretless Bass, Maplin 3800 Synthesiser 1978, Arturia Beatstep, Marsh Russian Drum Machine 1984, Beequencer, Single Cell Synth, Casio CZ 1000, MFB Drum Machines, Yamaha RX5, Crumer Organizer II Organ, Roland SH101, Roland 303, 8 bit delay slinky, Berhringer Pedels, The Owl FX Unit, Faderfox Micromoduls, Ableton Max For Live 9, Max MSP 6, Granulator by Monolake, RME A2D, Echo2, tape recorders and microphones. The album was Mastered by Andrea ‘Nax Acid’ Ruffino. For ‘The Resistance Of Honey’ soundtrack. Clips from ‘Bioni Samp – Pyramids Along The Caulder‘ were layered with binaural beehive recordings, live camera sound, location recorded field recordings, using Zoom, Marantz, Nagra recorders, location ‘Binaural Beeframe EMF Detector‘ recordings, and additional recorded interviews, often recorded on the spot, on location, with a radio clip mic inside my beesuit. 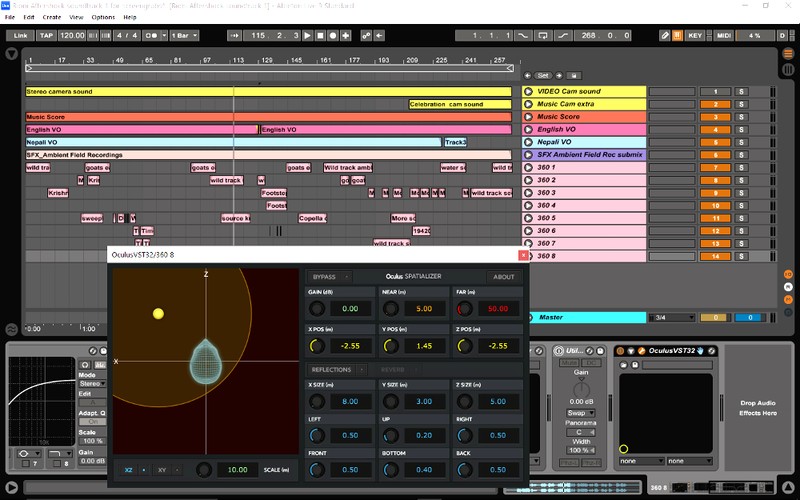 All audio layers were then processed in Ableton Max4Live 9.7 using Oculus software development kit plugins and a combination of other spacializer / ambisonics plugins, such as H3D by Longcat 3D Audio technologies. Some DSPs (used in 360 sound design) work better than others on different sounds and frequency ranges. Often spacializer / ambisonics plugins are used to the maximum to spatially position sounds fully in the landscape and are then mixed down and checked against each other to see if any plugin is educing too much distortion. Often the headphone mix won’t sound right over the 360 video and sounds need to be ‘softened’ slightly in the mix but still fully 3D positioned in the soundscape. So I often use some vintage compression and eq, but with great sounding modern plugins, such as Nomad Factory Blue Tubes. These are used to take the edge off overt sounds. Either final eq-ed sounds or problems with location camera sound and field recordings, especially bass and portable recorder hand / boom mic and tripod rumble noises, so they fit better with other layers of the soundtrack and don’t take over all the frequencies in the mix when 360 positioned. Mainly not interfering with the main VO is the priority in voice lead documentaries. Positioned 360 sound design is checked and viewed with a VR headset and on Sennheiser pro studio headphones. Followed by checking on various budget domestic headphones. Too much 3D processing can result in sibilance in the upper mid range and needs to be used carefully, especially with layered voice overs which have a wide range of frequencies which can be affected by another sounds extreme 360 audio specialization. The final dubbing mix to 4k video, of my sound design for ‘The Resistance Of Honey’ was mixed down, with emphasis on a good sounding headphone mix, all on ProTools by Ben Young at Young and Young Post Production, London 2016. We are still used to established cinema and TV screen languages even in 360 sound design but 360 videos are hopefully starting to make a new kind of video and audio VR experience and language. Where new levels of immersion are slowly beginning to change those original conventions and invent its own new forms. From these experiences I have been creating further sound design for this exciting new 360 video format. Recently offering consultancy on pre and post production sound design, plus overall sound design for various 360 videos. I’ve recently completed the sound design for a major charity’s 360 video about the earthquake in Nepal and how it affected the water system for a whole region.It follows the story of local plumber and his family as they struggle to ensure clean water flows again. English dialogue voice-over, Nepali voice-over, camera sound, location recorded field recordings, interviews and a pre-recorded, fully composed music score. What I learned on the sound design for ‘Aftershock Wateraid 360′ video is panning binaural sounds, close to the centre of the head can create glitches, where sound jumps from side to side. Each audio layer is listened to in my sound proof studio to eliminate, spacial ‘sound clashes’ leading away from the narrative. It’s easy to over spacialize / ambisonic location sounds with plugins and suddenly be surrounded, for example by ‘Goat’ sounds. They are everywhere, getting louder and louder, as one moves the VR headset around, distracting from the documentary narrative. In the ‘Aftershock 360’ video, the reality is there is only one ‘Goat’ in one of the scenes, so it’s sound is positioned as near to it as possible. Any more and viewers start looking around for more ‘Goats’ which aren’t there. But our ears are hearing them. People are not too used to the sounds of animals up close and the ears are constantly triangulating the position of binaural sounds to find them while telling the eyes to look for them… maybe from behind!!! and then it suddenly becomes easy for it to be a horror video story, not a documentary, where the 360 positioned sound creates, what I have begun to name: OSSU or ‘Overt Spacial Sound Unease’. These mixing techniques I am also currently exploring in my live performances and installations, but on stereo and multi channel speakers systems. In ‘Aftershock Wateraid 360′ video all the recordings were positioned in the final dubbing mix with additional 360 binaural elements, which were further processed in 3D from the Nepal camera and location field recordings. 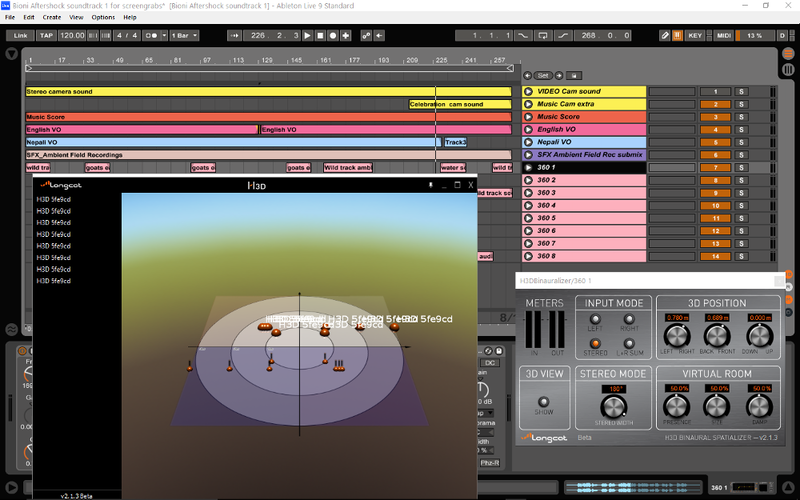 All audio layers were processed in Ableton Max4Live 9.7 using Oculus software development kit plugins and a combination of other spacializer / ambisonics plugins, such as H3D by Longcat 3D Audio technologies. Overall I created the sound design and final dubbing mix for three 360 videos; an ‘English’ version, a ‘Nepali Language’ version and an ‘Extras Reel’. Hive Synthesiser (6 oscillator prototype)Baby Bee Synth, The Bela Bee (with partial / samples taken from field recordings from two beehives) Electronic Beesmoker, Hex Mixer, MacbookPro, Ableton Max For Live, Beequencer, Honey Taster Resonance Detector, EchoFirewire Audio, Beehive Field Recordings. ‘Known for artist, musician, inventor, beekeeper and 360 sound designer. ‘In the 90s I was one of the first to use the RSS. (Roland Sound Space system) a 360 system that cost 40,000 + pounds. it was a ‘Revolutionary sound processor that creates a three-dimensional sound environment using conventional two-channel playback’. Now I have several 360 software programs for less than 500 pounds which work at a higher quality than the old 90s hardware. 20 years later, still working in post-production audio, I find 360 VR audio a very exciting new area for sound designers to work in who come from a film and video background like me. I’ve completed the sound design for ‘Resistance of Honey’ 360 (BBC) and recently ‘Aftershock’ 360 (Wateraid). We are still used to established cinema and TV screen languages even in 360 sound design but 360 videos are hopefully starting to make a new kind of video and audio VR experience and language. Where new levels of immersion are slowly beginning to change those original audio and video conventions and invent its own new forms’.